Repotting bonsai can be a little intimidating at first. 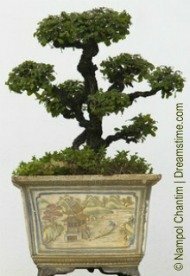 Pulling your tree out of its cozy pot, untangling and cutting away roots, and then packing in the new soil mixture just right can make even the most skilled bonsai expert nervous. But, repotting is very important to the health of your plant, and by carefully following the proper procedure, your bonsai will thrive and flourish in its new container. Taking care of your bonsai's root system is just as crucial as pruning and shaping its leaves and branches. The roots are very important to the health of your tree because they absorb and store essential water and nutrients and provide the security or support needed for growth and development. Allowing your plant to become pot bound causes the roots to form a tight tangled ball. In this condition, the tree will struggle to absorb moisture and nutrition and will begin to slowly starve to death. Repotting your bonsai regularly will prevent it from becoming pot bound so that the roots can do their job more efficiently. Root pruning is an important part of the repotting process. Pruning the branches and leaves of your bonsai tree will encourage the splitting of limbs into smaller, thinner, and fuller regrowth. This helps keep your plant small while also providing the lush, mature look that you desire. Root pruning serves a similar purpose. Cutting away larger, longer roots, will lead to branching, which creates a smaller, finer, and more compact root system. This will allow your tree to absorb nutrients more effectively and prevent it from becoming pot bound. Repotting also allows you to replenish your bonsai soil. Remember, in nature, a tree can extend its roots to surrounding areas in order to find the necessary nutrition. Bonsai, however, are confined to a small pot with very little soil, so the nutrients are depleted quite quickly. Since a fresh mixture is added during repotting, your plant will receive an infusion of the nutrients needed for health and growth. How often your tree will need to be repotted will depend on the species, age, size of container, and rate of growth. Younger, actively growing plants will need more frequent repotting than older, mature trees. When bonsai is growing vigorously, it is important that you replant every 1-2 years to prevent them from becoming pot bound; whereas, slower growing trees may be left for 3-5 years. Typically, repotting bonsai is best done in early Spring just before, or as soon as, the buds begin to open. Since the tree is not yet having to nourish and maintain rapidly growing foliage, the stress and damaging effects of repotting will be minimized and the root system will be able to repair itself quickly. If you have a flowering bonsai that blooms before the leaves begin to grow, make sure to repot after the flowering but before the buds open. Every year, you should carefully remove your bonsai from its container to examine the root system. If the roots are highly visible or circle around the outside of the soil, it is time to repot. However, if the roots are still contained within the soil, you can place the tree back in its original pot and re-check it the next year. Thread a length of copper wire through the wiring holes and fold the ends over the edge of the pot so that they are out of the way until needed. You will be using this wire to secure the tree to the container, so make sure that it is long enough. Place drainage mesh over the drainage holes. This will prevent soil loss and help stop insects from getting in through these openings. Cover the bottom of the pot with screenings or some other material that provides good drainage. Add a second layer of bonsai soil or compost. Set the pot aside until needed. Cut the securing wire from the bottom of the container and carefully remove the tree from the pot. If it is really root bound, it may be stuck to the sides of the pot. Gently run a root knife, or something similar, between the soil and the pot, to release the plant. Inspect your tree and decide if it needs repotting. If the roots are long and wrapped around the edges, then repotting is necessary. If there is still plenty of space for the roots to grow, you can put the tree back in its container for another year. Prune back long roots since this will encourage the tree to develop a more compact roots system. You will also want to remove any rotting or very large roots, remembering to keep everything balanced. If you notice an uneven root structure, try to prune in such a way that you restore balance as best you can. Typically, the goal is to remove about 1/3, or 33%, of the total root system, from both the sides and the bottom of the mass. Remember, the roots will dry out quickly, so you should have a spray bottle of water readily available if they need to be remoistened. Place your tree on the soil, slightly off-center, ensuring that it is at the correct height for your style and form. Add more soil below the plant if necessary. Wrap the copper wire over the root ball and twist together until the tree is held securely in place. Make sure to position the wire so that it will not be seen when the rest of the soil is added. Add the new soil in small amounts, using a chopstick or pencil to work it carefully around the roots. Keep adding the bonsai mixture until the pot is filled to about 1 centimeter from the rim. Continue to use the chopstick to fill any spaces and eliminate air pockets. The container needs to be completely full but the soil should not be compacted so firmly that it inhibits aeration. Quite often, it is incorrect after care, not the repotting itself, that causes the most damage to a tree. Immediately following repotting, it is important that you water the plant thoroughly to help the soil settle and remove any remaining air pockets. It is often recommended that you add a fungicide to your water to help further protect your bonsai. Keep your tree in a sheltered area away from direct sunlight and strong winds for at least one month. It will take your bonsai this long to recover from the stress of repotting so you will want to protect it as much as possible. DO NOT fertilize for 4 weeks following repotting as this can cause root burn and damage to your tree. Make sure that your bonsai receives adequate water to help it absorb the nutrients from the new soil. Repotting bonsai can be a complicated and time consuming process, but the more you do it, the more comfortable you will become. By following step-by-step instructions, your repotting experience will be a success, and you will enjoy beautiful, healthy bonsai.